Very nice B model ! is it still owned by Jim Hall ? 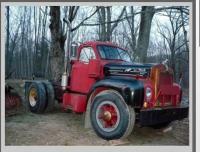 it was in the video I have trucks with 2 sticks he was in Maine and before him it belonged to a George Humphrey . Thank you for posting the date for Mack days looking forward to going. Nice truck ! I saw it at couple shows . Very nice ! That's great! Looking forward to hearing more details On your event . Maybe I can have the B model done by then ! Merry Christmas Barry and everybody at watts mack! :SMOKIE-LFT:glad to hear she's running again !